This section describes Clubsets and how to customize them for your particular needs. A Clubset is a collection of 14 clubs and their definitions. Think of them as the 14 clubs you regularly carry in your bag. OptiShot allows you to select from four default Clubsets and offers you the power to create a Custom Clubset that can be fine-tuned to match your clubs and their characteristics. 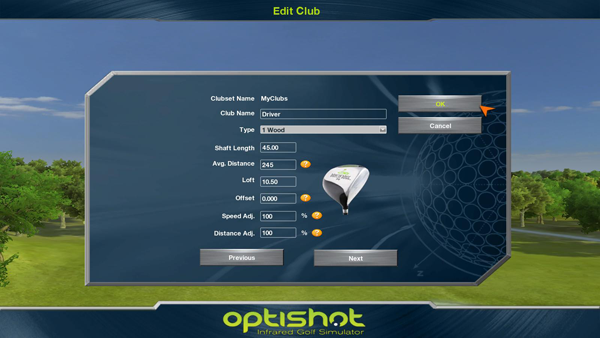 The Clubset window is where you create, edit and delete custom clubsets. To get to this window, open the Clubs menu in the lower right and click Manage Clubsets. 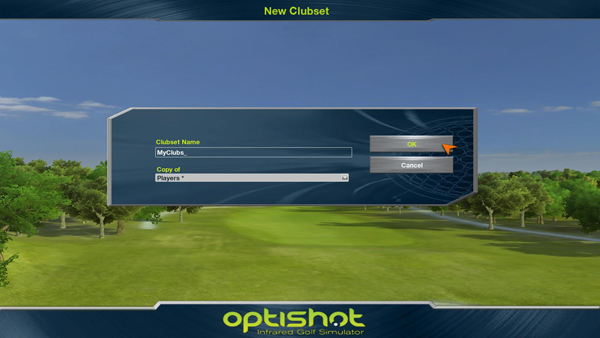 OptiShot provides you with four default Clubset configurations. We have worked hard to create defaults that should work for most players. Try out the included Clubsets to see if one is right for you. Used by better players, these clubs are often referred to as blades and have a slight offset or no offset at all. Used by a large number of players, these clubs have a small offset and usually a cavity or progressive cavity back. Also a very common club favored by less experienced players, these clubs feature a larger offset and cavity back. An increasingly popular set, these clubs offer an average offset and replace the longer irons (usually 5-3) with hybrid irons. If you find that these Clubsets don't quite meet your needs, see below for instructions on how to customize them. You can create as many custom clubsets as you wish. Each new clubset begins as a Copy of an existing clubset and contains all of the clubs and characteristics of that clubset. All of these can be modified to match your clubs and needs. To create a new clubset, in the Clubsets window click on the New button. The New Clubset window will pop up. Enter the name you wish to give to the new clubset. Select the default clubset you wish to copy as your starting point from the dropdown list. Click OK to create this new clubset. If you click Cancel no new clubset will be created. The newly created clubset now appears in the list of the Clubset window and is available to use for any player. OptiShot allows you to modify the clubs and their characteristics for any custom Clubset. Note: You cannot alter characteristics of the included Clubsets. To modify a Clubset, open the Clubsets window, select the set you wish to modify by clicking on its name in the displayed list, then click the Edit button. The Edit Club window will appear. You will see displayed the first club in this set. You can modify any of the settings for this club (see below for details on club characteristics). Use the Next and Previous buttons at the bottom of the window to navigate from one club in the set to another. Once you have made all of the changes desired, click the OK button to save those changes. If you click Cancel no changes will be saved. Enter the name you wish to use for this club. Select the type of club. Length of the club shaft (such as, 39 inches). The distance at which you want this club to be used automatically by Auto-Caddy within OptiShot. It will appear automatically in the Club field when this distance to hole is reached. Loft of the club in degrees (such as, 27 degrees). The amount in inches that the hosel is offset from the face of the club. Changing this percentage up or down from 100% (999% maximum) affects the reported club head speed and the resulting distance the ball will travel. This can be used to adjust the distance calculation by changing the percentage up or down from 100% (999% maximum). Make adjustments here if you do not know your swing speeds and your distances are off or the distances are still off even after entering your known swing speeds. You may find that your club manufacturer provides club specifications on their website. This is the most accurate source of this information. If not, you can contact them and they can usually provide a specification sheet for your clubs. To delete a custom Clubset, open the Clubsets window, select the clubset from the list and click the Delete button. The clubset will immediately be removed from the list of available clubsets! If a player has a clubset assigned to them (see Creating and Managing Players for details on how to assign a clubset to a player) and you delete that clubset, the player will be reset to one of the included clubsets. If you wish to delete a particular club from your clubset, for example you have no 6-iron in your bag, the process is fairly simple. Technically you cannot delete a club. If you change clubs using the up and down arrow keys on the keyboard or using the OptiShot Taskbar this club will still appear in the list. We are simply setting it up so that this club will never be automatically selected by Auto-Caddy. OptiShot's Auto-Caddy will select a club from your set that is appropriate for your distance from the hole. To ensure that a club is never automatically selected, simply go in to the Edit Club window and change its Avg. Distance to 999. This means that Auto-Caddy will select this club when you are 999 yards from the hole. In regular play this will never happen and the club will never be selected. Warning! There is one circumstance where this "999 yard" club will be selected. If you are in Game Mode and hit a shot off the tee, then take a Mulligan, you will be returned to the Tee Box, however Auto-Caddy will select your longest club, which will be this 999 yard club. You will have to manually change back to your driver!